The 'Listen' screen, accessed by tapping 'Listen' on the bottom of the screen, is where you control the playback and volume of your audio programs. Play/Pause: To play your program, tap the center arrow. During playback, this will display as a pause symbol (parallel vertical lines); tap again to pause your program. 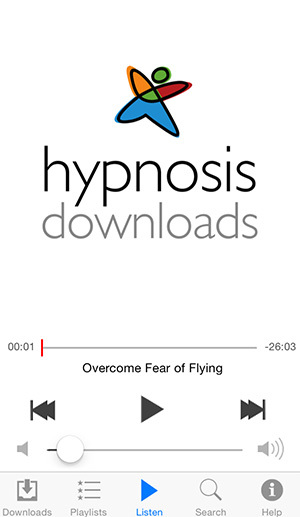 Skip forward/back: To skip forward to the next program in 'My Downloads' or your playlist, tap the double arrow symbol on the right. To skip back, tap the left-facing symbol. Fast-forwarding/Rewinding: To move forward and back within the current program, drag the red slider between the time indicators. Volume control: To increase or decrease the volume of your program, drag the round bottom slider left to decrease the volume or right to increase the volume. Please note that the volume will not actually change until you release the slider. Alternately, you can use the volume control buttons on the side of your iPhone/iPad/iPod.